All aboard the learning bus! 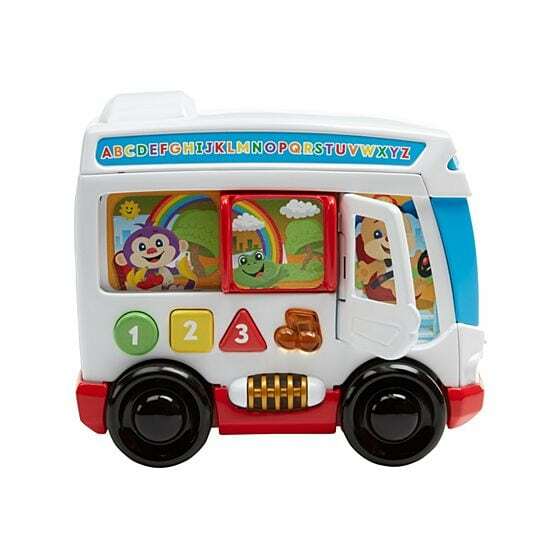 With tons of hands-on activities and entertaining songs and sounds, the Fisher-Price Laugh & Learn Learn Around Town Bus encourages little ones to crawl while introducing them to colors, numbers, shapes, and more IN GREEK! Get the fun rolling by pushing the bus along to hear playful songs and sounds. Unlock more learning content by opening and closing the peek-a-boo door and sliding the window back and forth. Babies can even build the “Wheels on the Bus” song with every press of the light-up music button. For more fine motor skill-building fun, there’s a bat-at roller to spin round and round. Your little one will love discovering all the learning fun on the Learn Around Town Bus! Where early academics come into play Colors & Shapes: As babies press on the three shape buttons and push and crawl along with the bus, they’ll hear fun songs, sounds & phrases, teaching them about familiar colors, shapes and more. Opposites: The Learn Around Town Bus introduces babies to the fun of opposites as they slide the window back & forth and open & close the door to see the friends riding inside.